VideoCardz leaks a couple more slides from the NVIDIA GeForce RTX marketing materials. Interestingly, NVIDIA is calling its GeForce RTX series "built to overclock". The company points out the new lineup has more power headroom, with higher-quality VRMs that offer cleaner power delivery. 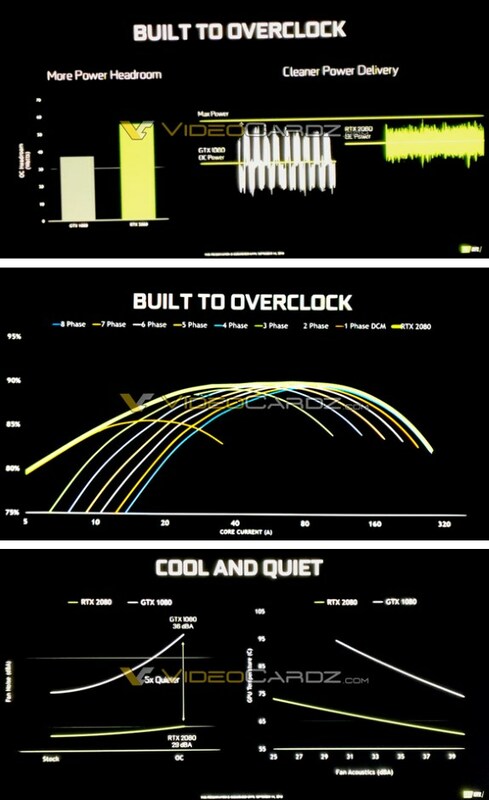 Then there's also a slide about the cooling solution, NVIDIA claims its new cooler is 5x quieter and 15-20°C cooler than its previous model. A bunch more GeForce RTX information is supposed to hit the web later today. The GeForce RTX driver should also start circulating today, which means we can finally expect some performance leaks.